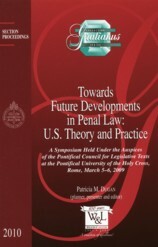 This is the proceedings of a symposium held under the auspices of the Pontifical Council for Legislative Texts and the Pontifical University of the Holy Cross (Rome, March 5-6, 2009). The symposium included presentations about resolutions to the conflict between need to know and confidentiality; the considerations and options for preliminary investigations; the role of the Promoter of Justice when balancing rights; pastoral principles within the penal process as they relate to can. 1341; the collection and evaluation of proofs; and the resolution of cases by rescript, penal precept, or decree. It includes a general canonical backgrounder for interpreting the USCCB Essential Norms for the Context of the Evolution of Canonical Penal Law. 100 visitors have consulted this page.